One of the more high-minded zombie films you’ll find, I Walked with a Zombie is as much (melo)drama as it is horror. There’s not a hint of the humor that was to propel the spoof Zombies on Broadway two years later, nor the explicit brain-munching that was to propel, well, every zombie movie from Night of the Living Dead onward. Still, there’s a dark, brooding atmosphere and nice production value (more so than is usually allowed in horror movies) that makes IWWAZ watchable and downright classy…given the whole walking dead thing. It’s sort of like a zombie soap opera…and not one of those trashy ones, like Passions or Days of Our Lives. I’m talking General Hospital or The Young and the Restless here. 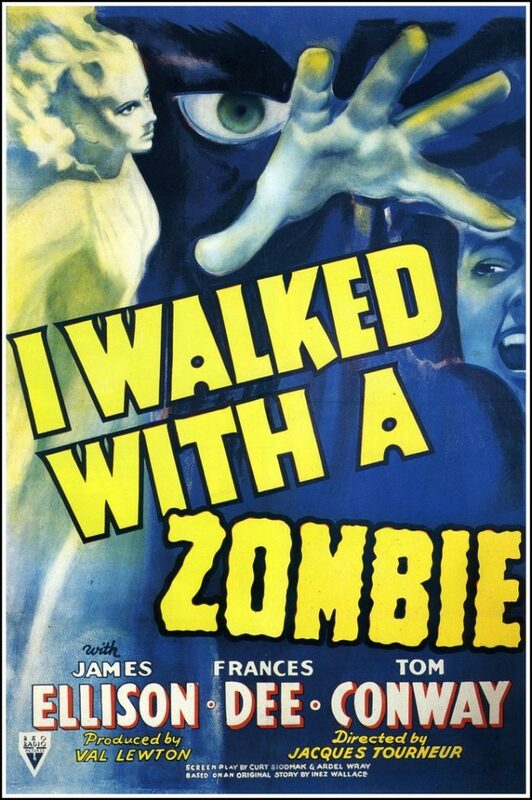 Anyway, for the time, the black characters in I Walked with a Zombie are fairly dignified; there’s no shuckin’ and jivin’ going on here, although all of them are, of course, servants and/or voodoo worshipers. 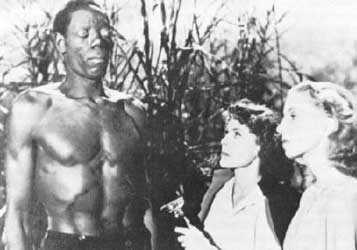 There seems to be some attempt to portray voodoo in a realistic, non-exploitative light…at least, until they roll out the massive, hulking zombie “brute” with bug eyes (Darby Jones). The imposing Jones has few scenes, but they are the most impactful, as they’re the only ones that provide any sort of scares. While no overt offense was meant at the time by the creators, it’s hard not to read racial overtones into the scenes of the huge, mindless black man preying on the helpless, ultra-white woman. The brooding, noir-ish atmosphere of the film owes a great deal to the oversight of producer Val Lewton who also produced the original “Cat People”, “Curse of the Cat People” and “The Leopard Man”. Adding to the low-key feel of the film was director Jacques Tourneur who did a pretty creepy episode of “The Twilight Zone” (original series) titled “Night Call”. For awhile, back in the ’70s, I worked with Val Lewton’s son at the Smithsonian National Collection of Fine Arts where he was the exhibits designer.